The following options can be directly achieved through our service-team and are available within 24 hours. You start with a briefing with our creative team, who will accompany you from the first scribble up to the final template. All creative templates based on the latest candidate studies, eye-tracking and long-term expertise in recruiting. In case you have corporate defaults or you use style guides, we will take this in account while drafting. Preferably we will also use your own artwork, otherwise we use images from an external database. 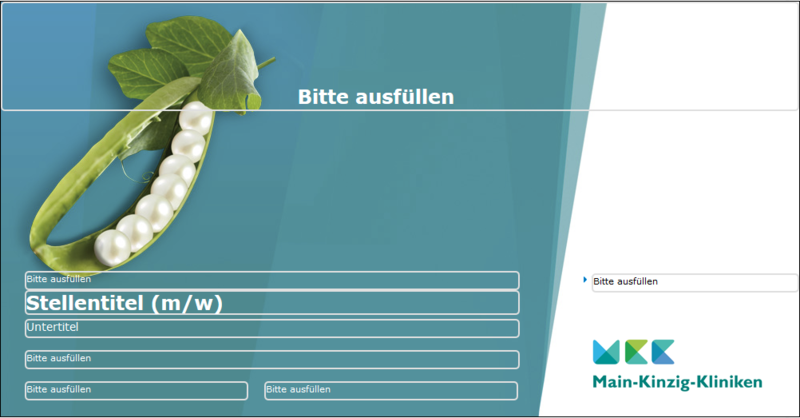 You can start working after the acceptance of the new design. We create your design template from a delivered job advertisement as a PDF file, Word document or a graphic file. Then tell us which areas in the display should be editable. In the final step, we define the template in the One-Click-Recruiter and you are ready to go. Present vacancies clearly listed on your website, intranet or Facebook. Your career portals are individually adjusted to your corporate design and can easily be controlled via the One-Click-Recruiter. You can publish and de-publish ads with only one click. Via plug and recruit technology (PaR-T), getting your individually designed career portal installed by yourself and running within 24 hours proved child's play. You decide yourself which of the following elements in the basic version need to be shown and styled. The basic version contains the standard categorization, standard search, company logo, job title, subtitle, job site, as well as the buttons for the "view of the advertisement" and route planning. The career portal as IFrame including installation instructions will be delivered by mail directly to your IT-administrator. Based on our experience, the installation takes no longer than an hour, referring to the most relevant content management systems such as WordPress, Typo3 and many others. In case you need technical support, our service is available at any time. Consistency is the key word for successful recruiting. 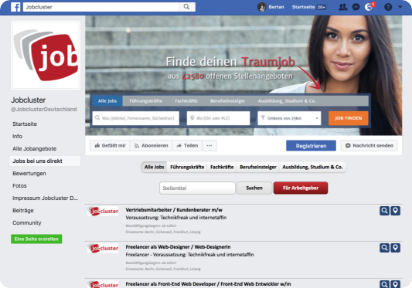 With our Facebook job app, we revalue your Facebook business presentation to a completely customizable job board. This is analogous to the career portal, but can also be used as a single module. Here, customizable means that all presentation and configuration options are available - (see also: career portal / intranet). We also make it also available within 24 hours and without any effort on your part. 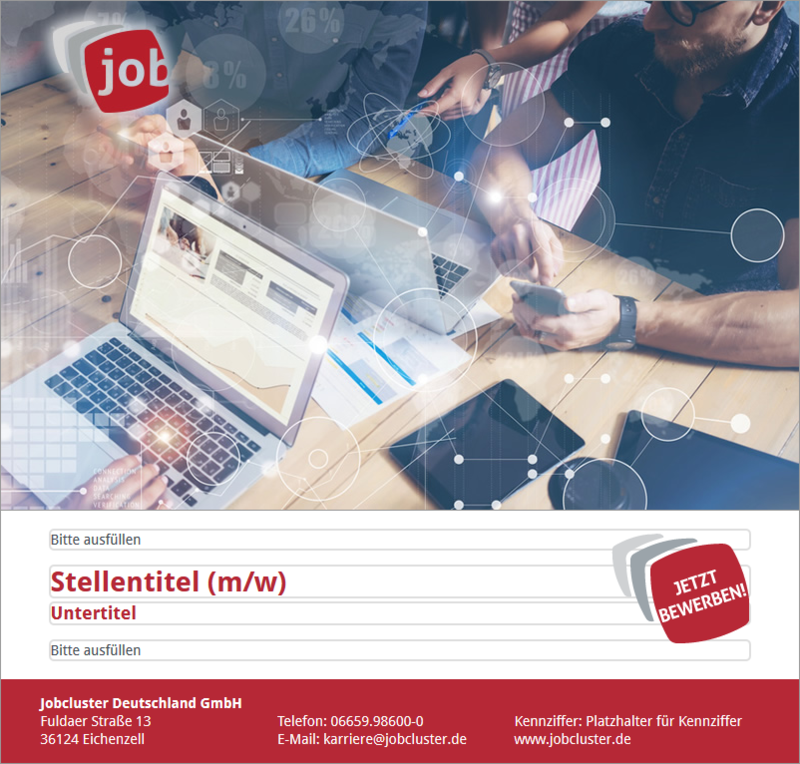 Do your requirements for job output require maximum flexibility? No problem! 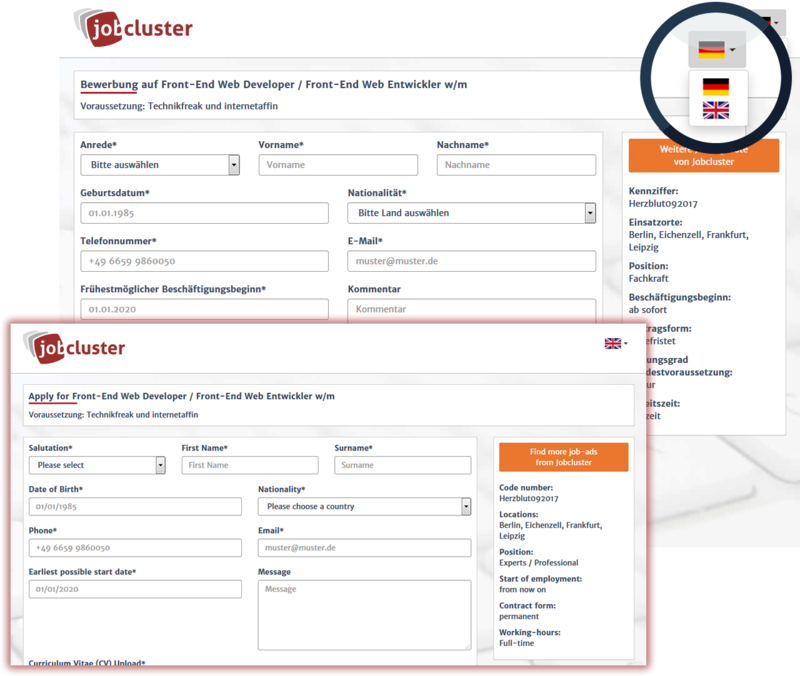 Your personal job export via the One-Click-Recruiter includes all fields and categories entered in the job ad form by the user. In addition, more individual parameters of the interface can be transmitted. Jobs are easily published and de-published again via the One-Click-Recruiter with just a click. The API can be provided as -XML, php-serialized array, HTML table, JSON or RSS feed, and the job output as HTML. 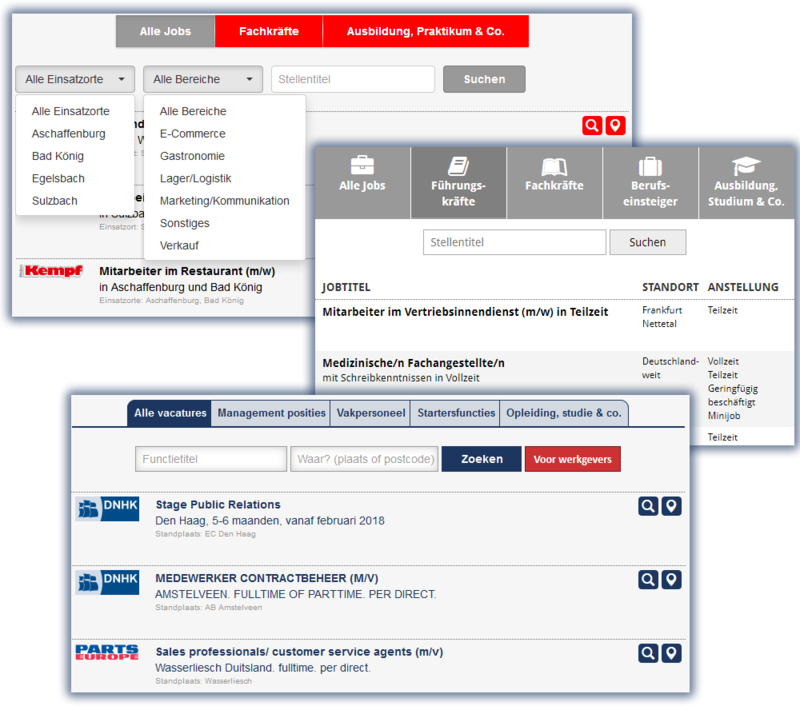 The "Job output via interface" product can be used in conjunction with career portals or as a single module. Facebook, Twitter, LinkedIn, Instagram or other popular social-media channels. When using our plug and post-technology (PaP-T) to serve your own social media world, things go much easier than ever before. After setting up, the One-Click-Recruiter will post for you automatically. Thereby we always ensure a consistent corporate of your job ad. In addition, the posts can be enriched by individual parameters. 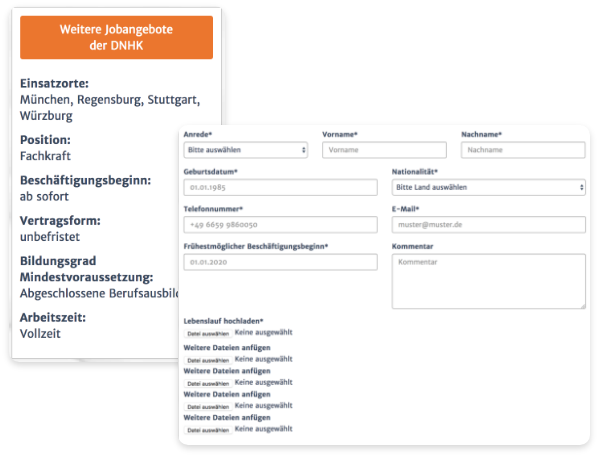 The form or the applicant sheet can already be selected as a contact possibility for incoming applications while entering job ads via the One-Click-Recruiter. Of course all other contact possibilities remain possible, besides using an email application or your own candidate links. All of these options can be used even with the integration of an applicant management system. as well as being stored for you in any language. The application form is a successful add-on especially for companies do not use candidate management system or shy away from the enormous time and expenses involved following an investment. Applicant data will be prepared absolutely structured and transparent including the almost infinite wide range of export options. Mail, CSV, XML or in any other format - consult us. The "applicant form" product can be used in conjunction with career portals or as a single module. Subscribe to our newsletter, where you will always find the latest version of our roadmap! 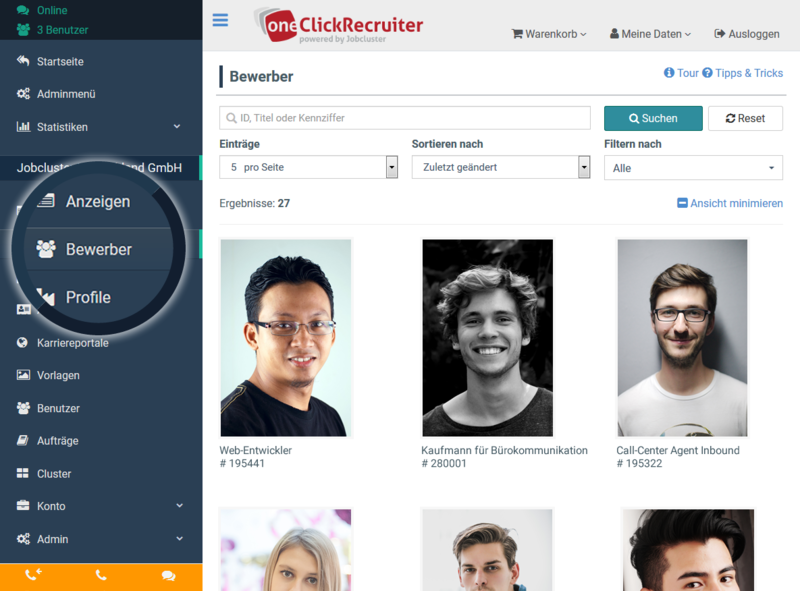 Explore all other available inetgrated options of the One-Click-Recruiter.